"Hands down best vet we've been to!" us in the past 24hours. We are so appreciative for everything." on his own yesterday and again today! He is our world and we are so thankful." all saved him and I couldn't thank you enough . Everyone was so wonderful!" 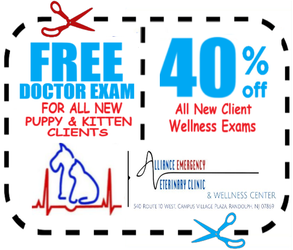 for better professionals to take care of our beloved animals." showed Rocky this past weekend. God was watching over us when he brought us to you. Thank you." so they can make $ not Alliance. I would go back there again with confidence!! Dog is in great shape and got her mojo back"
"Thank you so much for the care everyone gave Buster you all are truly angels. support while going through the process with Buster." Her! Thank you from the bottom of my heart! You all are great, wonderful, loving, fantastic people." have major medical coverage (not just wellness) for my pet which is the responsible thing to do. don't eat junk food myself, why should I feed junk food to my dog?" and we had no idea what to expect walking in and we were greeted with warmth and compassion. and their pets in an emergency. Thank you again for your warmth , compassion and help." "Roo was treated for an eye infection by the vet on Easter evening. eye pressure and follow up would not have happened." throughout the year- P.S. Oliver really loves you guys!" of you helped her and comforted her through til the end. I Appreciate everything you have done for us." amazing care of our beloved Echo. Words cannot really describe how grateful we are." "Thank you all for showing compassion for our beloved pet Dusty. We greatly appreciated your help during that difficult time." have done without you. It was the first time my family had to euthanize our oldest dog."